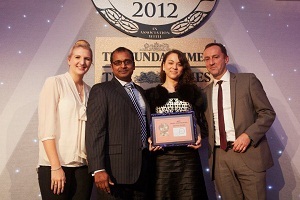 Phew Conveyancing Wins The Sunday Times and The Times “Best Small Conveyancer of the Year 2012” bronze award | Phew! Ealing: West London-based law firm Phew Legal Services (www.phewconveyancing.co.uk), that does legal business with the brand name Smart Legal Solicitors, has won bronze award in The Sunday Times and The Times “Best Small Conveyancer of the Year 2012” awards. The service of Phew conveyancing solicitors was described as “magnificent” by the judges of the Award that was held on 6th of December at the Lancaster London Hotel. The awards recognise “the best of the best” conveyancing solicitors who have made a significant contribution to the home moving process. The event was attended by industry leaders in the property and the legal sector. Rezaul Haque, the Director said, “We are delighted to win this important award especially being such a young firm.The London property market suffered a massive blow in 2008 but we soldiered on against the odds by focusing on what our clients and the property market need. We take a long-term view to our relationships and are continually working with estate agents and mortgage brokers to perfect our service. To be described in the judge’s report as “magnificent” is an achievement we treasure highly”.